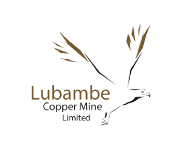 We are a team of highly experienced health and safety professionals. We will guide you through the implementation process and make the system work for your unique business and safety needs. What benefits does Safety Champion OHS software offer? 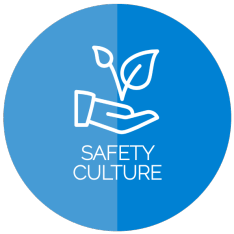 Cultivate a strong safety culture with an engaging and easy-to-use system that will help bring everyone on board with safety in your workplace. 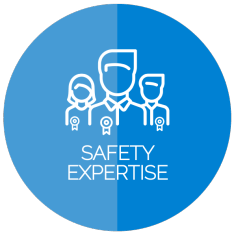 Developed by experienced and qualified safety consultants, you can be confident that Safety Champion will assist you to manage your legislated health and safety duties. Gain access to Safety Champion in minutes, not days, then configure the system to suit your unique business and safety needs. 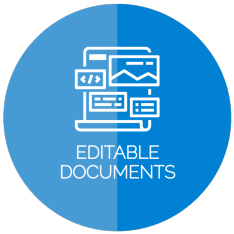 Access over 100 editable documents and templates – including a safety manual that is ready to be configured for your business. Safety Champion will help you manage your legal and moral health and safety obligations to ensure that your workers stay safe at work. And that’s the ultimate goal, right? Safety Champion is health and safety software that has been designed for businesses where the administration of health and safety is coordinated by a small number of people at each workplace. This may include a sole trader or one-workplace business, or a business with multiple workplaces. 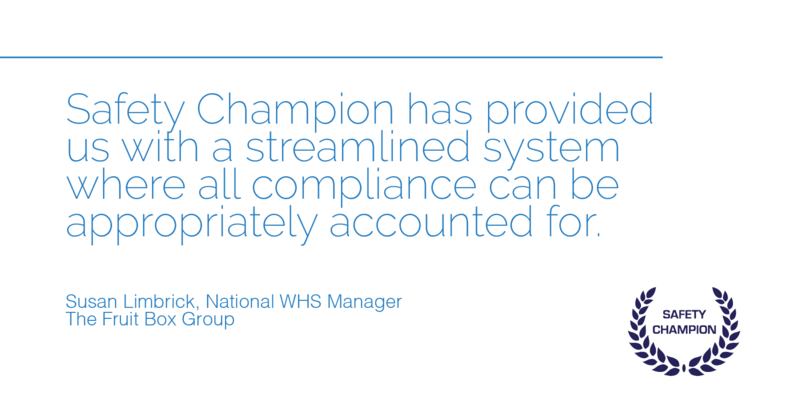 Safety Champion is a web-based application, meaning your system is managed in the cloud. Managing your health and safety software in the cloud means that your safety management system is accessible to all managers and workers at any time, on any device – this includes laptops, tablets or mobile phones. Safety Champion will assist your business to better manage its health and safety management system. It will allow all workers to play an active role in health and safety and ensure that your business is better positioned to keep the mantra of “work safe, home safe” alive and well. Access Safety Champion anywhere and any time you have an internet connection. This means that your health and safety program is no longer bound to the confines of your workplace and/or your computer. It is no fluke, Safety Champion has been developed to work on all devices. Safety Champion will recognise and reconfigure to the device that you log in with (i.e. desktop, tablet or smart phone). This unique capability provides you and your workers with the ultimate user experience. Safety Champion’s intuitive layout, makes Safety Champion incredibly easy to use, resulting in happy users. Happy users, will lead to an implemented health and safety program. Don’t be told otherwise, ease of use is incredibly important. Don’t settle for less. Safety Champion software comes pre-loaded with a Health and Safety Manual that has been developed to complement the features and outputs within the software, along with the requirements of the relevant International and Australian/New Zealand standards. To achieve this, Safety Champion comes pre-loaded with over 50 health and safety workflows that your workplace can select from. Alternatively, if there is something specific to your business, that is easy as well, you can create your own. These safety management system workflows have been defined from legislative requirements, compliance codes and relevant standards. Once a workflow has been selected by a business and allocated to a workplace, the person(s) identified to coordinate the health and safety program at the workplace will be sent an email notification before- and on the day that the task has been scheduled for completion. If the task has not been signed-off within Safety Champion, these email notifications will continue until the task is signed-off. 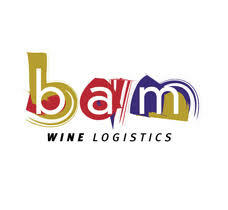 This will ensure that all set tasks across the business are completed. If the task is recurrent, once the task is signed-off, the task will automatically be rescheduled in Safety Champion. Rescheduling will be in line with the task frequency that is defined by management. At sign-off, Safety Champion will also store any evidence that is uploaded by a business to demonstrate that a task or investigation has been completed. This “storage” feature, ensures that your business can demonstrate implementation of your health and safety management system during an audit, or a health and safety regulator visit – now, or years into the future. If required, the Safety Champion software and our associated documentation can assist businesses to address requirements that are often requested within tender applications, or from larger clients. What may have seemed confusing or unreasonable in the past is now a lot easier to manage. Our interface is fully responsive! Accessible on phone, tablet or desktop, Safety Champion assist business owners and safety managers to maintain visibility of the health and safety practices within their workplace from any device, at any time. Safety Champion health and safety software will provide management with an overview of the implementation of your safety management system across all workplaces, from the dashboard. Management will also receive email notification when incidents and hazards have been reported into the Safety Champion health and safety software. Designed by health and safety consultants, Safety Champion is health and safety software that you can rely on. Our team of consultants have supported and positively impacted hundreds of small and medium sized businesses operating in Australia and internationally. Our team has consolidated their knowledge on what works, and what doesn’t when it comes to safety management systems, in order to develop this health and safety software solution. Built using a quality management system mindset, Safety Champion health and safety software can be configured to support your workplace to successfully manage its Quality Management and Environmental Management needs. Safety Champion health and safety software comes with online help guides and support manuals that have been configured to each level of use. 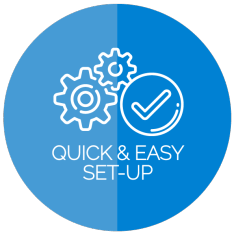 Our support module ensures that you will always have access to one of the health and safety software team should the need arise. Being a Software as a Service (SaaS) product, the monthly licence fee to access Safety Champion health and safety software is based on a combination of the total number of workplaces and workers across your organisation – contact us for more information and to discuss a quotation. Keen to simply get safety sorted? We hear you! Introducing Safety Champion into your workplace makes sense. You can be confident that safety practices will be implemented into your workplace, effectively and consistently. Are you keen? Contact us now for a demonstration of the Safety Champion health and safety software.